I love me a delicious pasta dish. Pasta dishes are both filling and easy to change up to your liking. This recipe is definitely a new favorite. It is jam packed with delicious flavor. Sun-Dried tomatoes are like heaven to me. Combine them with spinach and it is perfection. One of my favorite snacks to this day is a bowl of freshly made sun-dried tomatoes and sautéed spinach. Due to time, this recipe took a short cut on both of those methods, but still tastes fantastic. 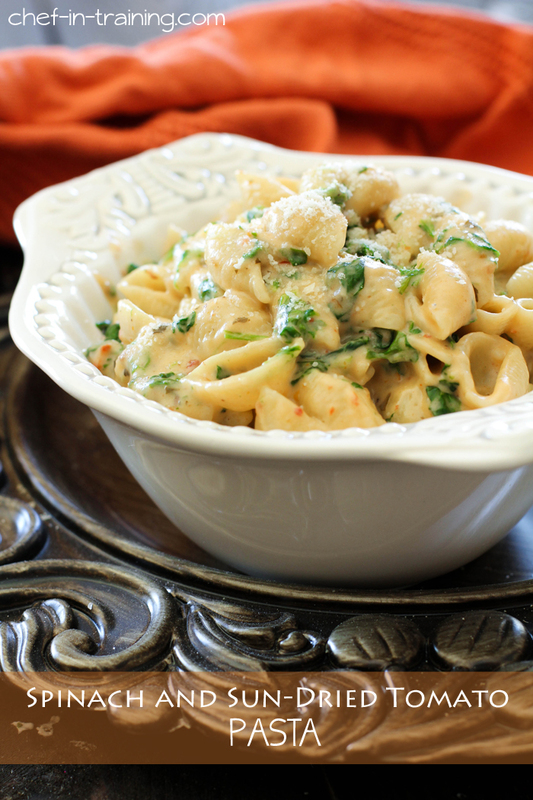 Added to a creamy rich Alfredo sauce, this Spinach and Sun-Dried tomato is a tasty and unique way to change up your typical pasta dishes. I hope you enjoy this dish as much as my family did! This pasta dish is jam packed with delicious flavor that will keep you coming back for more. Cook pasta shells according to pasta directions. Once cooked set aside. Melt butter in saucepan, add flour and stir to combine to form a roux. Once you have your roux, add half and half (or milk) slowly and stir constantly until sauce thickens. Remove from heat and stir in Garlic salt and onion powder until well combined. Add Parmesan cheese and stir in well. Add Sun-dried tomatoes and spinach to sauce and stir to evenly incorporate. Pour sauce over drained pasta shells and gently stir until all the shells are well coated. I love sun-fried tomatoes and this past is calling my name! Looks so good! this sounds amazing. i love how easy pasta dishes like this can be! Looks delish! Do you Drain and chop the tomatoes or put them in with oil and all? Thanks for replying!!! I've never made a dish like this before so I wanted to be sure I got it all right!! Thanks again!! Does fresh spinach work in this dish? This sounds amazing. It just went to the top of my list of things to cook when I move into my new place. Looks easy and good. Thanks! This looks uh-mazing! I love sundried tomatoes and pasta and spinach. This is on my Ziplist to make for the future! I'd love for you to link this up at our Super Saturday Link Party today at Bakerette.com. I LOVE the simplicity of this dish! I see this recipe calls for garlic salt. Is there a substitution if I cannot find garlic salt?